This year’s BU111 Live Case Competition gave students the opportunity to dive deeper into the business strategies of Starbucks, the global coffeehouse chain that currently operates more than 28,000 locations in 62 countries. This particular case challenged the five finalist groups to pitch a corporate partnership to Starbucks that would drive enrolment and use of their loyalty program among the millennial demographic. Each group took a completely different approach to strategic partnerships and presented their ideas to a panel of business leaders who are experts in client engagement. The first group to present, Lab B02 pitched the idea that Starbucks should partner with networking facilitator, Ten Thousand Coffees. They suggested that combining the activities of Ten Thousand Coffees members with faster Starbucks reward points would be a natural fit for the two organizations. 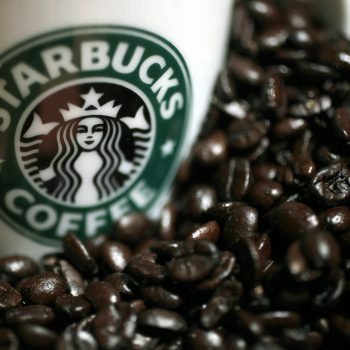 Lab B04 advocated for a partnership between Starbucks and Costco, taking advantage of the 10 million Canadian members of the retail club to drive customers to Starbucks’ in-home products. Lab B10 promoted a strategic partnership with Waze – the user-generated travel app. Their idea was that the more useful a Waze contributor is, the more Starbucks rewards they receive. Lab D06 took advantage of Starbucks’ approach to corporate social responsibility and environmental sustainability and pitched a partnership with TenTree, a company that plants trees around the world. A Starbucks membership would allow users to track the number of trees they’ve planted through your purchases. The final group, Lab B09, sought to strengthen the existing relationship between coffee shops and reading by promoting a partnership with Kobo, the largest e-reader company in Canada. Starbucks members would receive special offers from Kobo and take part in special members-only promotions and staff recommendations. The judges were impressed with the level of creativity and professionalism of each group. “You’ve made our jobs very difficult in choosing the ranking order of your presentations,” says Ryan Hegarty. The Live Case Competition is an annual event that involves all first-year students in the BBA program’s BU111 class. The project is designed to simulate and stimulate consulting thinking and approaches. A real problem, faced by a real company that requires students to identify, research and present feasible solutions. It builds research, writing, critical thinking and presentation skills. Each year students are presented with a new company and a current issue the company is trying to resolve. The company meets with the students at the end of September for a question and answer session so that students can ask for clarification or additional information that they would like after having read the case write-up and done some preliminary thinking and research. A group presentation that requires students to critically compare their individual recommendations and determine what they would like to present to the company. Presentations are selected to advance to semi-finals and ultimately five are chosen to present in the finals to the company and outside judges.